Traveling Sardine Class: I really don't want to know . . . I really don't want to know . . . 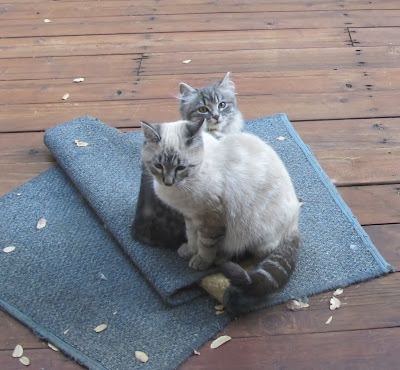 The kitties on the deck, otherwise known as The Ferals, come and go. I lose track of the generations, sometimes even unable to remember which kittens came from which mom and which litter. I try not to get attached. I'm an advocate of the Trap-Neuter-Release programs which limits the growth of feral cat colonies which tend to keep out non-colony members, thus placing a limit on the cat populations in a territory. Problem is, I'm not organized enough to Trap. It takes patience. My attempt to remain detached wavers from time to time. This guy (or girl) in front is a beautiful and unique cat, appearing here with Nina's Little Kitten. He is missing. I saw him the day after I got back from my niece's wedding. That would be November 12 or 13. Kitties can disappear for a few days, because they visit other people, too, but my Kitty Sitter didn't see him while I was away at quilt camp either. Mama Kitty is the one I call Barefoot, because she's the only striped kitty around that has no Socks or other white markings. She was intensely interested in my room addition project. She hung around watching the guys work. They had to be careful not to lock her in when they left at night once construction was closed in. While the addition was still in the framing stage, she'd scale up the 2"x 6"s and walk around on the floor joists. 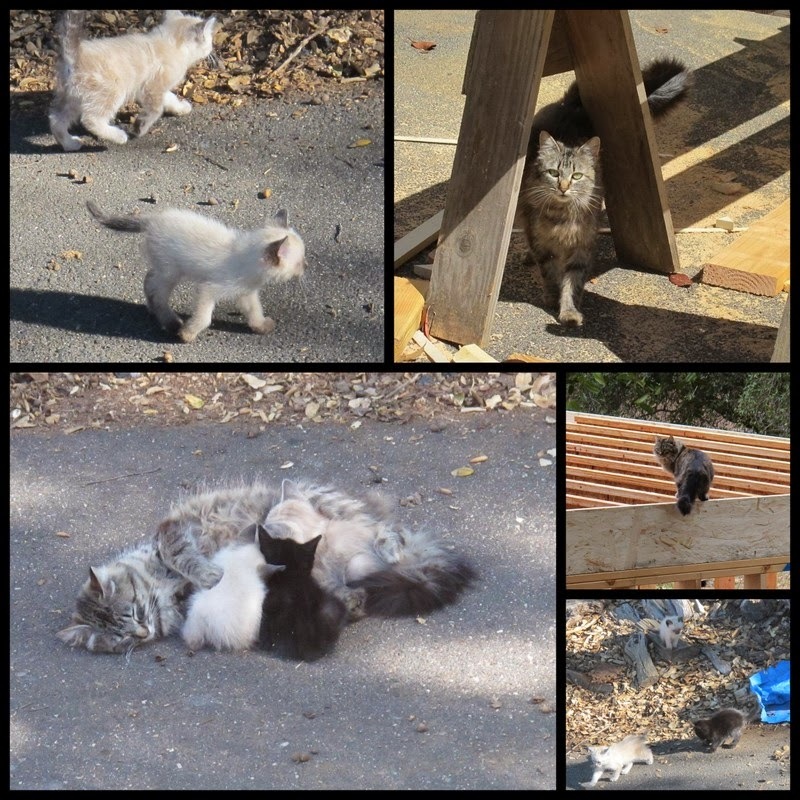 Then one day in May I spotted three little fluff balls scampering around on the driveway near the tarp-covered wood pile. Two were light-colored, one with pure Siamese markings and the other with subtle body markings all over. The third was black. I can guess that the perennial Black Kitty, who was abandoned in the neighborhood many years ago when his people left, was the Papa. But I've never seen a Siamese running in the neighborhood. I worry about the vulnerability of the light-colored kittens in the wild. They stand out like a beacon when they romp in the leaves in the woods. I talked to the Kitty Sitter and we each expressed the hope (or wishful thinking) that someone thought he was a beautiful kitty and adopted him. I hadn't seen Sister-in-Law since she got back from Niece's wedding and I returned from Quilt Camp, so I dropped in to see her the other day as I went by the office where she works. She asked me about the cats, both my indoor Hothouse Flowers and the little band outside and I told her I was worried about Stripey Siamese. She blanched. "I wasn't going to tell you this, because I wish he hadn't told me... Your next door neighbor told me the other day that he and his son were sitting on their deck when a huge owl came swooping down and picked up a cat and carried it off, screaming." She never cries, but her eyes welled up. I didn't ask her whether he described the cat taken. I don't want to know. I wasn't going to tell anyone this story, but it's been haunting me. I want to believe that Stripey Siamese will wander up one of these days after being on a romp somewhere, looking for some of my cheap dry cat food. See you . . .
We have a lot of hawks around here and they will definitely carry off a cat or a tiny dog. One came after a dove near the deck and the whole thing was covered with feathers. I guess nature isn't too neat and tidy. By the way, I wouldn't want to know which one either. Yikes. Did I hear someone mention shoes?